Chicks Isan is helmed by chef Ohm Suansilphong, who is also the chef at Fish Cheeks. Ohm grew up in Thailand, and first learned to cook from his parents, who owned a restaurant. He then went on to work in fine dining, cooking at Nahm in Bangkok, an upscale restaurant featured on Pellegrino's World's 50 Best Restaurants list. In 2016, Ohm opened Fish Cheeks, a seafood focused Thai restaurant on Bond Street in Manhattan’s NoHo neighborhood. With Chicks Isan, Ohm is looking forward to continuing to introduce New Yorkers to the flavorful dishes he grew up eating in Thailand, thoughtfully prepared with expert technique. Along side Ohm, Jennifer Saesue is the co-owner, that is responsible for everything outside the kitchen. With her background of managing multiple restaurants in New York City over 10 years. She is also the co-founder of Fish Cheeks NYC. Opening in December 2018, Chicks Isan is a new fast-casual concept serving contemporary Thai cuisine inspired by Thailand’s northeastern Isan region. 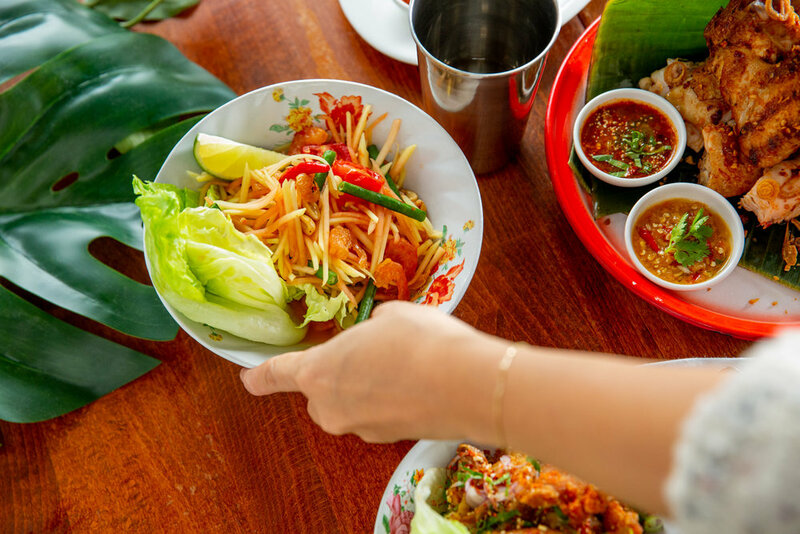 Located in Dekalb Market Hall in bustling Downtown Brooklyn, Chicks Isan is helmed by the team behind Fish Cheeks, the critically-acclaimed Thai restaurant in NoHo with a focus on seafood. Chicks Isan takes a modern approach to Thai food, spotlighting the bold flavors of Isan – a region known for bright, complex dishes, simply prepared with fresh ingredients. Bordered by Laos and Cambodia, the vibrant cuisine of the Isan region reflects this geography, featuring ingredients like dried chilis and tamarind and fresh herbs such as mint and kaffir lime that truly set it apart from the flavors found in Bangkok and the southern region. Developed by chef Ohm Suansilphong, Chicks Isan will focus on regional staples that showcase Isan’s cuisine, a complex interplay of sweet, sour, spicy and salty flavors. Specifically inspired by the highly revered and extremely proprietary method of barbecued chicken, a popular street food in the Isan region, the restaurant’s namesake and signature dish of Grilled Chicken (Kai Yang) anchors the menu. Chicks Isan’s version is first marinated with shallot, garlic, turmeric and coriander root then butterflied, flattened, and threaded onto bamboo skewers before being slowly grilled. The menu also includes various Isan favorites such as crispy, fermented Sour Cured Pork Riblets (Naem Si Krong Mu) and refreshing Papaya Salad (Som Tum Thai), as well as modern takes on classics, like Fried Chicken Larb, with mint, cilantro, toasted sticky rice and roasted chili powder; Crispy Rice Salad with sour pork, mint, chili and lime and Spicy Short Rib Soup with kaffir lime, lemongrass and fish sauce. The entrees, all under $TK, can be paired with a side of Sticky Rice or Jasmine Rice, and Vegan Coconut Ice Cream is made in-house. thoughtfully curated with an emphasis on Brooklyn businesses that reflect the cultural and ethnic diversity of the borough, with the continued goal of supporting small, local eateries and up-and-coming culinary talent.